Housebuilder Walton Homes reports strong interest at its Hathorn Manor site in Rugeley. 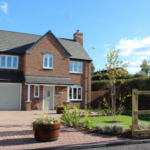 A development of 11 high-specification new homes in Rugeley has been hailed a success by housebuilder Walton Homes. With five of the plots already reserved, the housebuilder has announced it has early bird and assisted move reservations held on two further plots. The company chose to site another development in the town following the response to its previous Rugeley site, Woodbury Walk. Hathorn Manor is located off Wolsley Road, and comprises of 11 four- and five-bedroom high-specification luxury properties.